In 2001, there were an estimated eight million unauthorized foreigners in the US, and the six million in the labor force were about four percent of the 143 million US workers. 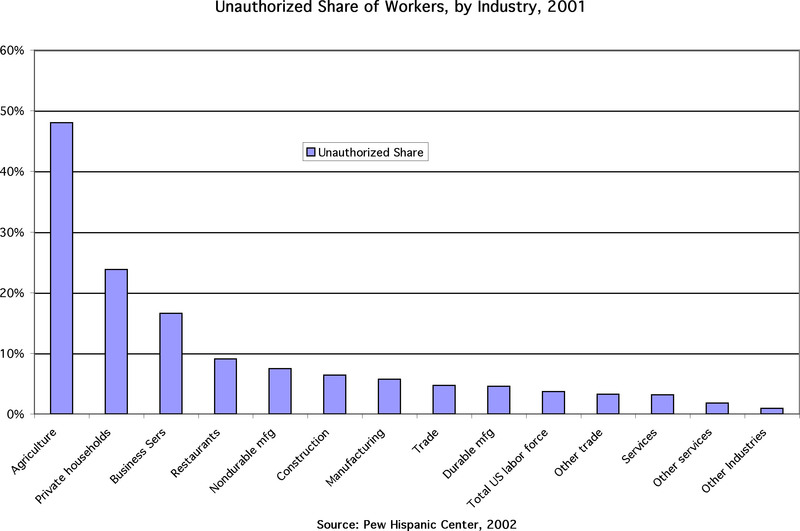 The unauthorized share of workers varied by industry, from almost half of the workers employed in agriculture, a quarter in private households, a sixth in business services such as cleaning and security, and about 10 percent in restaurants. By 2004, there were an estimated 10 million unauthorized, suggesting that the 7.5 million in the labor force were five percent of the 148 million US workers.